Nothing beats the sight and smell of a real Christmas tree. If you can handle the mess of moulting needles, an evergreen conifer is the only way to bring in the festive fun. We've tracked down the best places to find a proper tree in Glasgow and Edinburgh. 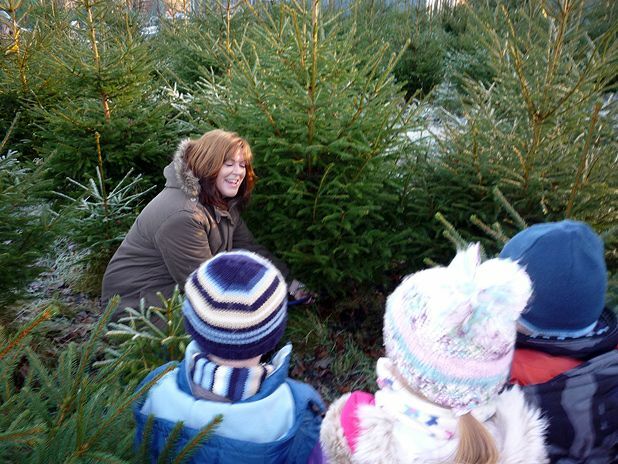 Caring Christmas Trees (various outlets, 0845 111 8733, www.caringchristmastrees.com) has outlets for their sustainably-farmed Nordmann Firs in various locations around the country, including Glasgow, Edinburgh, Dundee, Aberdeen, Musselburgh, Paisley and Fife. The ‘caring’ part of the title comes from the people in need who benefit from the sale of trees. Depending on your area, you can help a rough sleeper off the streets or provide vital support to a family in crisis for whom Christmas would otherwise be a miserable affair. Prices range from £35-£55 for trees measuring 4-8ft in height; delivery is available for an extra fee. See website for more details of charities and collection points in your area. If you’d rather get your hands dirty, Finlaystone Country Estate (Langbank, Renfrewshire, 01475 540505, www.finlaystone.co.uk) is letting visitors come in and tag the tree they’d like from Fri 20 Nov, then come back later to chop it down themselves. All trees are of the very traditional Norway Spruce variety; any under 6ft will cost £24, while trees measuring 10ft and over will cost £45. The tree chopping is being presented as part of a wider programme of family-friendly festive events: Christmas gift stalls and a Santa’s Grotto will be situated on the grounds, with ready-prepared trees, wreaths and firewood also up for sale. Local tree delivery can be arranged at extra cost. Loch Lomond Garden Centre sell a selection of tree varieties. There's also a cafe. Dobbies Garden World (Melville Nursery, Lasswade, 0131 663 1941, www.dobbies.com) sell real and artificial trees in a variety of styles and sizes, with sizes available from 2-15ft, and prices ranging from £19.99-£299 (or up to £750 for a more luxurious model). Delivery is free on orders over £100, and a wide range of lights, garlands, wreaths and flowers is available too. Green Fir Christmas Trees (0131 618 2875, www.edinburghchristmastrees.com) are based in Edinburgh city centre, and deliver without charge to most areas throughout the city (see website for map). The trees used are the ever-popular Nordmann Firs (which have a good reputation for dropping fewer needles), with sizes ranging from 5-12ft for households or 25ft for businesses, priced between £55 and £150. The Forestry Commission in Scotland has a number of outlets for tree buying around the country, including one at Blairadam Wood, near Kelty in Fife and one at the erstwhile mountain biking mecca Glentress Forest (Tweed Valley, near Peebles, 01387 860247). Just passed Edinburgh airport is Conifox Nurseries Tree & Plant Garden Centre (www.conifox.co.uk), which has a full range of Christmas trees ranging in size from 4ft to 10ft Nordmann Firs and Norway Spruces. What's more, the tree are indoors and out of their wrappers, making it much easier for you to pick the perfect fit for the living room – they even have an online gallery. Newhailes estate in Musselburgh sells Christmas trees from its nursery inside the National Trust site. Hopetoun House, to the west of Edinburgh sell trees, logs and other goods and their Christmas tree prices start at £35. Pines and Needles (020 3384 9420, www.pinesandneedles.com) is a London-based web site that delivers trees all over the UK; luckily, their sustainable farm supplier is based in Perth, so next day delivery to Glasgow or Edinburgh costs only £19.95. The trees themselves come in a variety of species, and range from small tabletop varieties to 7ft models, with prices starting at £35.95. Decorations, lights, stands, wreaths and garlands are also available. Real Christmas Trees (0845 604 8366, www.realchristmastrees.co.uk) sells firs and spruces from 4-60ft in height. Prices for trees between 4-20ft range from £36-£395, and include free delivery; anything larger is subject to a fee. A selection of wreaths, mistletoe, holly and lights is also on offer.